The formal launch of the Moto X is still a day away, but it’s easy to predict the response from some corners. With so much anticipation built up — some of it from Google and Motorola executives themselves — there are bound to be those who are disappointed. And, of course, the naysayers will have a point. 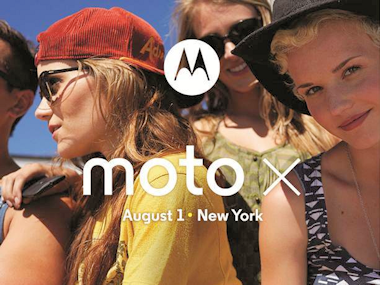 The Moto X, however nice it may be, isn’t going to revolutionize the phone industry. It’s an Android phone, one of many devices packing Google’s latest software into sleek, powerful hardware. Motorola has a lot of ground to make up in brand and reputation, and this phone alone won’t single-handedly change its perception in the market. But that take also misses a larger truth. The Moto X represents the start of Motorola as a Google-run hardware company, not its ending point. Unlike rivals that live and die by their latest hero phone, Motorola has a parent with the deepest of pockets. Even as the company has been working on products such as the Moto X and the new Droid lineup announced last week, Motorola has also been looking further down the road. CEO Dennis Woodside and special projects chief Regina Dugan gave a sense of their ambitions at our D11 conference in May, suggesting a future that goes far beyond the smartphone of today and that includes things like electronic tattoos. Don’t get me wrong. The Motorola folks are pretty proud of the Moto X itself. They see it as a darn good Android phone with some pretty nice features. And they hope to sell a lot of them. But they also are aware that it is just one of many flagship phones, a crowded field that includes the Samsung Galaxy S4, the HTC One and Sony Xperia Z, plus that iPhone. Nor do they expect to truly surprise people, given all that is known about the Moto X. It has been the subject of many a leak at this point, including photos, technical specifications and more. At D11, Woodside talked about its always-on sensors and battery capabilities, as well as the fact it would be made in the USA. Early ads have suggested customization options, as well. Meanwhile, the device is also expected to share some characteristics of the new Droid series introduced by Verizon Wireless and Motorola last week. Those phones pack a custom X8 processing unit, along with an always-listening voice-command system and a camera that awakens with a twist of the wrist.